The cards themselves aren’t particularly exciting. It is far more about what each of these cards represents that’s important. I wanted to take today’s article to look at each in turn as a way to share what I believe is most important about Magic. I suspect it will also offer some insight into the lunacy that is me and my decks! If you don’t need to click the link to find out what that card does, then you are even farther into my wheelhouse than I am! 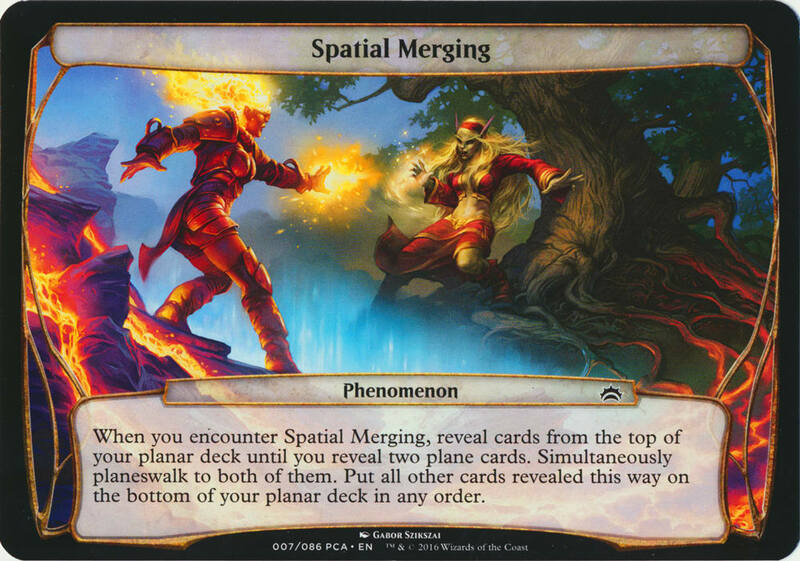 Spatial Merging is a Planechase card, and before we go any further, I want you to stop and realize that I chose a Planechase card in my Top 5. This card will never get in any of my decks, but I love it for everything it represents. First off, I love Planechase. The format is amazing. It does wonderful things for multiplayer Magic games. While I normally play it with all the cards stacked in the middle of the table, I have played a “planar map” version that gives you choices about where you planeswalk to. I have also proposed a draft version, but I haven’t had a chance to play it yet. Planechase takes your typical Commander game and adds a layer of chaos that you only somewhat control. Every turn the cards add a layer of crazy to the format. Games where you are mana screwed or flooded can be turned on their head when the right plane shows up. With a one in six chance of traveling to a new plane on every die roll, you aren’t likely to stay anywhere too long. Spatial Merging itself takes that wacky and ramps it up by letting you be on two planes at the same time! Twice the effects makes things particularly wild! It isn’t until Spatial Merging shows up that you realize just how well some planes work together and how miserable it can be with others sharing space! Some of my favorite moments in games have resulted when someone is able to play a relatively innocent spell, only to have the entire game dumped on its head because the two planes made the moment insane. Planechase brings the chaos! I love most special release sets, and Unstable is one of my favorites! I have drafted the set repeatedly and built all sorts of decks with the cards. My friends and I are pretty much okay with including Unstable cards in our Commander decks, but Buzzbark is the extreme for this. There are a lot of Unstable cards in the deck, so it pushes acceptance of Un- cards to an extreme. Many players don’t like manual dexterity cards and others take particular issue with Buzzbark. Players don’t want their cards nicked or dinged in any way and Buzzbark wants to throw dice at them! I solved this issue by using foam dice, so they leave practically no marks. Also, as the deck has gone through various edits, I almost never use Buzzbark’s ability to try to do damage to my opponents’ creatures. For the most part, it rarely destroys the creature I’m looking to take out. However, I can easily create a board state with five or more creatures that would all love to get +1/+1 counters. All of this makes for a commander and an entire deck that players enjoy playing against. Watching someone stand up and drop a dozen foam dice with a rainbow of colors spilling out all over their playmat is a new experience for many and it is memorable for all. In the end, the deck is not any more difficult to stop than your usual token deck, but it gets there in a way that is very unusual! 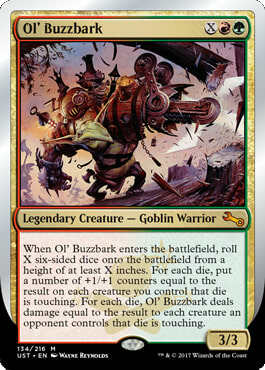 Ol' Buzzbark reminds me of the fun that Unstable cards bring to me and to most everyone who plays against them. Even players who don’t particularly like the set enjoy seeing something unusual once in a while, and Unstable brings that. 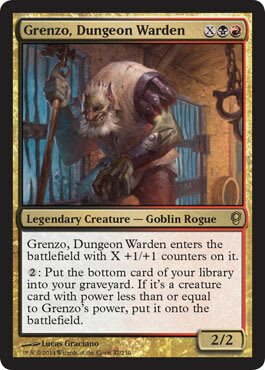 Grenzo, Dungeon Warden represents the Conspiracy sets for me. No sets have brought me more joy than Conspiracy. A draft format for multiplayer games is exactly what my group loves. We have certainly played more Conspiracy drafts than anyone outside of Wizards of the Coast. There is no other set that I have bought “cases” of than Conspiracy. Every year there is not another Conspiracy set always brings me a little disappointment. Add to that love of Conspiracy generally, a love of how Grenzo, Dungeon Warden plays. The idea that the deck revolves around what is at the bottom of the library, rather than the top, is a whole new axis most players can’t handle. Looking for cards that put cards at the bottom of your library means that many of the cards that go into a Grenzo deck really don’t go anywhere else. My favorite part of the deck comes when it is time to start flipping blindly from the bottom of the deck. I vividly remember flipping 13 cards at the end of my opponents’ turn, pulling up all sorts of creatures including a Gray Merchant of Asphodel. Grenzo brings so many “big play” moments and many of them involve not really knowing how it will all play out. The whole table really gets into it when you blindly slam the first card down on the table. Is it a creature or a dud? Did you defy the odds and get four out of six cards as creatures or did it go badly and you hit four lands in a row? Another part that I love about the deck is the flexibility. I have removed almost every creature in the deck for another creature at one point or another. As long as the creature has an enter the battlefield ability, has a power of three or less, is Red, Black, or colorless, it could end up in my Grenzo deck! 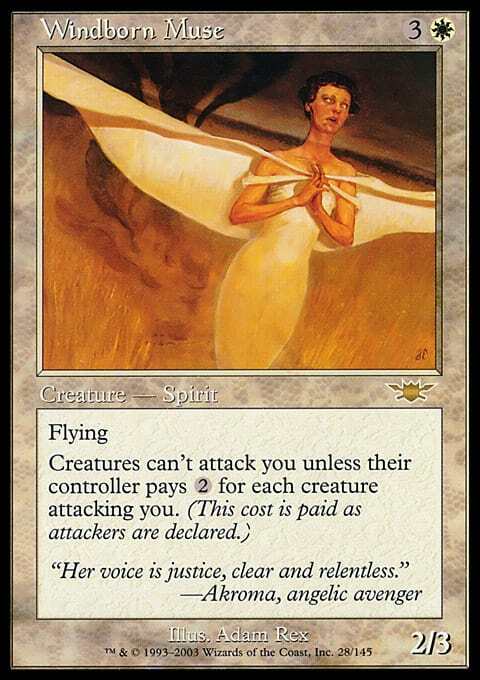 Windborn Muse reminds me of the start of my journey into the Magic community. After taking part in the StarCity Games Talent Search, Brandon Isleib, Darryl Bockett, and I started the Muse Vessel. Our small website allowed each of us to write about multiplayer Magic to a small, but dedicated audience. We each developed our writing style and produced content every week for a year. Since we wrote for the Muse Vessel, we thought it would be fun to each write as one of the Xborn Muses in the cycle. Brandon had the unique decks so it just made sense that he would be the Seedborn Muse. Darryl is the Black mage of the group, so Graveborn Muse just made sense. I pushed the importance of community and fun in gameplay, and this seemed to fall into the Windborn Muse category, so that became my card! The only problem? I don’t really like the card! It doesn’t represent my playstyle. I appreciate what it does, but most of the time, it doesn’t make my decks! During that time we grew as writers. We became better at our craft and pushed each other to produce the best articles we could. We drew the attention of Wizards of the Coast, who gave us a preview card, and our site grew in popularity. We became good friends and enjoyed the chance to talk about life and Magic, as well as hit every deadline! It was also the start of discovering the Magic community. I had the chance to interact with readers in the comments. I talked to players on various social media sites. I began attending Grand Prix events and conventions. The three of us grew out of the Muse Vessel and into GatheringMagic and then later to other sites, including two years writing the Serious Fun column with DailyMTG. For me, Windborn Muse represents the online community and everything I have found here online. Auratog gets the nod for #1 for nostalgia reasons. When I lived in Prince George over 15 years ago our play group was my total source of Magic games. I didn't buy singles, I just built decks with whatever I had on hand. This meant some decks were awkward piles that didn’t necessarily work well together. My wins were cobbled together by holding the powerful cards I did have until just the right moment, staying in games through politics, and never being the biggest threat. My signature deck involved Auratog and Rancor. I would sacrifice and recast Rancor multiple times to get a huge, trampling Auratog. Most players could see it coming, but by then there was little they could do as they had used their removal fighting each other. When I left that group to go to law school, they presented me with a t-shirt that had the Auratog stitched on it with the words, “Beware the Quiet Guy” right underneath. Auratog reminds me of good times with my first play group and the start of a bigger journey in life.